Toxicology is the science of poisons, which are sometimes referred to as toxins or toxicants. The former term applies to all natural poisons produced by organisms, such as the botulinum toxin produced by the bacteria Clostridium botulinum. The latter more generic term includes both natural and anthropogenic (human-made) toxicants like dichlorodiphenyl trichloroethane (DDT), which is perhaps the most commonly recognized toxicant. Even though the botulinum toxin is extremely toxic to humans, and DDT is relatively toxic to insects, it is important to recognize that virtually any element or compound will become toxic at some concentration. For example, iron, which is an essential component of hemoglobin , can cause vomiting, liver damage, and even death if it is ingested in excess. This concept of toxicity was recognized five centuries ago by the Swiss alchemist and physician Paracelsus (1493–1541), who stated that, "The right dose differentiates a poison from a remedy." How much of the toxicant an organism receives depends on both the exposure and dose. Exposure is a measure of the amount of a toxicant that comes into contact with the organism through air, water, soil, and/or food. Dose is a measure of the amount of toxicant that comes into contact with the target organ or tissue, within the organism, where it exerts a toxic effect. The dose is largely determined by how effectively the toxicant is absorbed, distributed, metabolized , and eliminated by the body. As a consequence, basic toxicological studies include measurements of the effects of increasing doses of a toxicant on an organism or some component of that organism (e.g., tissue, cell, subcellular structure, or compound). The measurements are commonly plotted as dose–response curves. 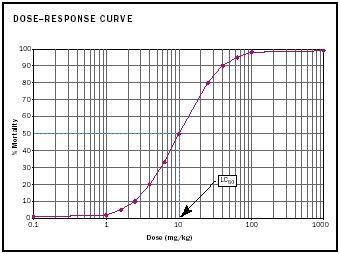 A dose–response curve typically ranges from relatively low concentrations that do not elicit a toxic effect to higher concentrations that are increasingly toxic. One of the great challenges to the science of toxicology is the prediction and discovery of chronic, sublethal responses. For example, in the 1920s, excessive exposure of workers to tetraethyl lead (the lead in leaded gasoline) in several United States gasoline production facilities caused approximately fifteen deaths, and over three hundred cases of psychosis. Despite this discovery of the apparent hazard of lead in gasoline, and the concerns of many at the time, rigorous scientific studies were required to demonstrate the subtle, sublethal dangers of chronic lead exposure, including adverse neurological effects in children, which eventually led to the ban of lead additives in gasoline in the United States. of toxicants, those measurements are more difficult to quantify because the responses are often less absolute and more complex. For example, chronic benzene toxicity causes lung cancer, but it may be years before that benzene-induced cancer appears, and many other factors may retard the development of that cancer ( antagonistic effect), contribute to its development ( synergistic effect), or independently cause lung cancer (e.g., smoking cigarettes). Forms of toxicity can also be characterized by the type of adverse response they create. Carcinogens cause cancer, either by the initiation or promotion of an uncontrolled growth of cells. Mutagens cause mutations by altering the DNA sequences of chromosomes. Teratogens cause mutations in the DNA structure of developing fetuses that can result in developmental abnormalities. The latter form of toxicity includes the infamous teratogen thalidomide, which was prescribed as a sedative for pregnant women before it was found to cause severe birth defects in their children. Resolving the adverse effects of a toxicant are further complicated by the variations in those effects in different species. Some species are more sensitive to certain toxicants than others, and the effects of toxicants on different tissues often vary between species. Because such variations occur between humans and rodents, in spite of the similarity (95%) in their DNA, extrapolations of laboratory studies on the effects of toxicants on rats and mice to human health must always take this into account. Moreover, the toxic effects of a pollutant on the gall bladder of humans cannot be determined in studies involving rats because rats do not have gall bladders. There are also relatively large differences in the sensitivities and effects of toxicants between individuals of the same species. Fetuses, neonates , and infants are more sensitive to the neurotoxic effects of lead than older individuals, because lead interferes with the development of the central nervous system, which is formed during the first few years of life. Finally, healthy individuals are generally less sensitive to pollutants than individuals with weakened immune systems who are less capable of responding to additional threats to their health. Genetics also plays a major role in the sensitivities of individuals. Although some differences have been observed in humans, the most commonly recognized genetic differences in toxic responses have been observed in other species. These include the acquired genetic resistance of some mosquitoes to DDT and some bacteria to antibiotics. However, the development of molecular techniques to genotype humans has now made it possible to identify individual sensitivities to different toxicants. Another important aspect of toxicology is risk assessment, which is a characterization of the potential adverse effects resulting from exposure to a toxicant. Risk is the probability of an adverse outcome. The basic steps involved in risk assessment are the identification of the magnitude of the hazard, which is the potential for harm of a toxicant, and the resultant characterization of risk, which is the probability of realizing that harm. The results of risk assessments are routinely used by regulators to establish acceptable concentrations of toxicants in the environment. Environmental toxicology is a relatively recent field that examines the occurrence of, exposure to, and form of toxicants in the environment, and the comparative effects of these toxicants on different organisms. DDT, for example, is a pesticide that has been used to control mosquitoes responsible for spreading malaria. Although this pesticide is effective in combating the spread of malaria, DDT and its chemical products have also been found to affect reproduction in birds by causing egg shell thinning, and in other organisms (e.g., alligators) by altering their estrogen balance. Consequently, studies of toxicology now extend well beyond dose–response assays of toxicants on specific target organisms to analyses of their impact on entire ecosystems. In addition to anthropogenic toxicants like pesticides, environmental toxicologists also study naturally occurring toxicants, such as metals and metalloids. Selenium, for example, is a naturally occurring element that is essential at low concentrations in the diet of many animals. Excessive intake of selenium, however, can be toxic to organisms. In the 1980s scientists working at Kesterson Slough in the San Joaquin Valley, California, observed a large number of deformed and dying waterfowl. The slough was part of a water project designed to receive and evaporate excess irrigation water and remove pesticides from the highly productive agriculture regions in the San Joaquin Valley. The observed effects on the waterfowl were eventually linked to an excess of selenium in the water. The selenium accumulated in the slough because the soils and runoff from the valley were naturally rich in selenium, and because evaporation in the slough further increased its concentration in the water. In this example, it was discovered that a rare, but naturally occurring and essential element was unwittingly concentrated to toxic levels in the environment by human activity. SEE ALSO C ANCER ; DDT (D ICHLORODIPHENYL TRICHLOROETHANE) ; H AZARDOUS W ASTE ; H EALTH, H UMAN ; L EAD ; R ISK . Crosby, Donald G. (1998). Environmental Toxicology and Chemistry. New York: Oxford University Press. Needleman, H.L. (1998). "Clair Patterson and Robert Kehoe: Two Views of Lead Toxicity." Environmental Research 78(2):79–85. Ohlendorf, H.M.; Hoffman, D.J. ; Daiki, M.K. ; and Aldrich, T.W. (1986). "Embryonic Mortality and Abnormalities of Aquatic Birds—Apprent Impacts of Selenium from Irrigation Drainwater." Science of the Total Environment 52(44). Williams, P.L. ; James, R.C. ; and Roberts, S.M., eds. (2000). Principles of Toxicology: Environmental and Industrial Applications, 2nd edition. New York: John Wiley & Sons. Society of Toxicology. Available from http://www.toxicology.org . A user friendly website, Tox Town http://toxtown.nlm.nih.gov/main.html has been developed by the National Institutes of Health to provide information on toxic substances likely to be encountered in everyday situations and the health risks associated with them. The site can be searched by clicking on an individual toxic such as mercury, toluene or asbestos to see where it might occur, or by clicking on a location, such as a school building, or drinking water to see what toxics could be encountered. Links to sites describing the health and environmental effects of each toxic substance are easily accessed.